For a legendary downhill skiing experience, visit Stowe Mountain Resort, located just 7½ miles from Trapp Family Lodge. This world-class ski area is now part of Vail Resorts and included in their EPIC season pass. A year-round destination with activities for every season, including downhill skiing, snowboarding, tennis, performing arts, and more, the ski resort is also home to Vermont’s highest peak, Mount Mansfield at 4,396 feet. With over 300” of natural snowfall annually, the mountains of Stowe Mountain Resort offer the perfect skiing conditions. Enjoy downhill skiing and snowboarding on 116 trails, with 83% snowmaking coverage. Kids and beginner-level skiers can take advantage of private lessons to enhance their skills on the slopes. 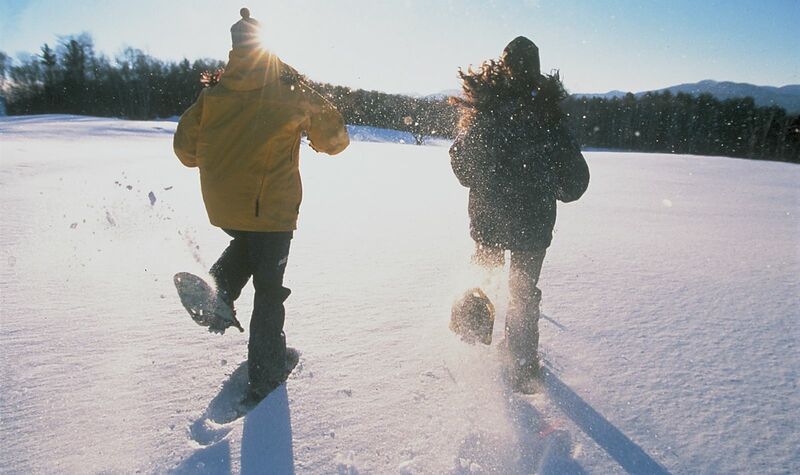 Cross-country skiing and snowshoeing are available at Stowe Mountain Resort, though you can just walk out of your door and enjoy that right here at our Lodge. If skiing is not your forte and you want to experience a different side of Vermont than what our Lodge offers, Stowe Mountain Resort has plenty to keep you entertained. The resort boasts eight eateries, five bars, a spa and wellness center, two distinctive 18-hole golf courses, a number of shops, childcare facilities and activities, and a performing arts center. They also host a number of events year-round, including live music concerts, theater performances, and fun festivals. Stowe Mountain Resort is only 7½ miles from our resort, meaning you can be skiing down the mountain in no time! Just contact our Front Desk to set up transportation by taxi for your day of downhill skiing and snowboarding. Please note that the shuttle to Stowe Mountain Resort runs on the weekends from December through the end of February and every day during Presidents' Week.